Wally West is once again at the core of the story in Flash 10, as Joshua Williamson gets joined by Felipe Watanabe on the art. There are two villains in the story, one old, and one new. The newbie gets most of the action in the story. Papercut is an entertaining villain, probably destined for minor villain status, though he would fit in well with the Rogues. Wally is the first to go up against him, and underestimates the man. Wally’s eagerness to be Kid Flash is more or less his undoing throughout this tale. 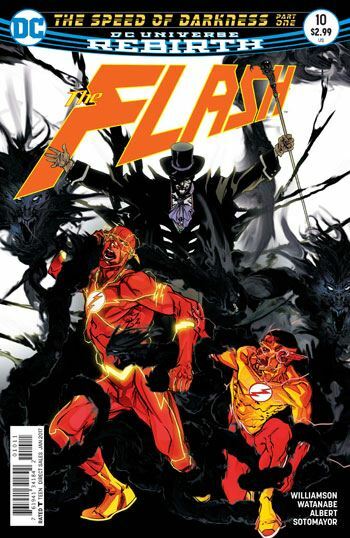 The Flash is upset with him for not taking the time to study the situation, protect the potential victims, and make sure the bad guy is really down. Iris is also upset with Wally, for skipping school in order to play Kid Flash. 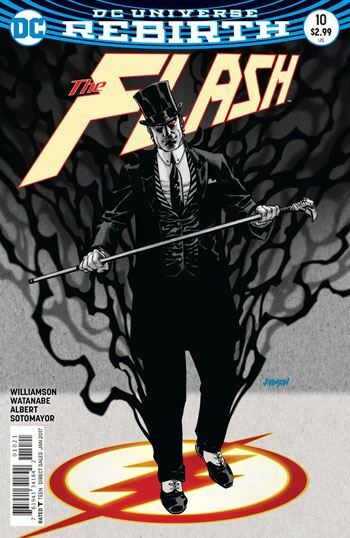 As for Wally, while he is also upset with the Flash for not revealing his real identity, he is certain that if he can just impress the Flash and Iris enough they will change their tune. So it’s some well written motivations for the various characters. Good intentions all around, which you can see building towards creating a terrible situation. And a terrible situation just happens to be brewing. Williamson also brings back The Shade in this story, turning the immortal back towards his villainous ways. So much development had been done with The Shade in the pages of Starman that I was concerned it might get dropped or fall by the wayside. But no, Williamson seems to have other plans, and though the Shade is quite different than when last we saw him, this clearly is the same man. But now without hope. And it is that question of hope that makes me think this is part of the bigger picture, part of Rebirth. The Shade has lost something, and I think part of what he lost was Jay Garrick. And after all, whose helmet was seen at the end of the previous issue? Is the return of the classic JSA imminent?